DEVON CCC members have been enjoying some pre-season reading to get them into the mood for the summer ahead. 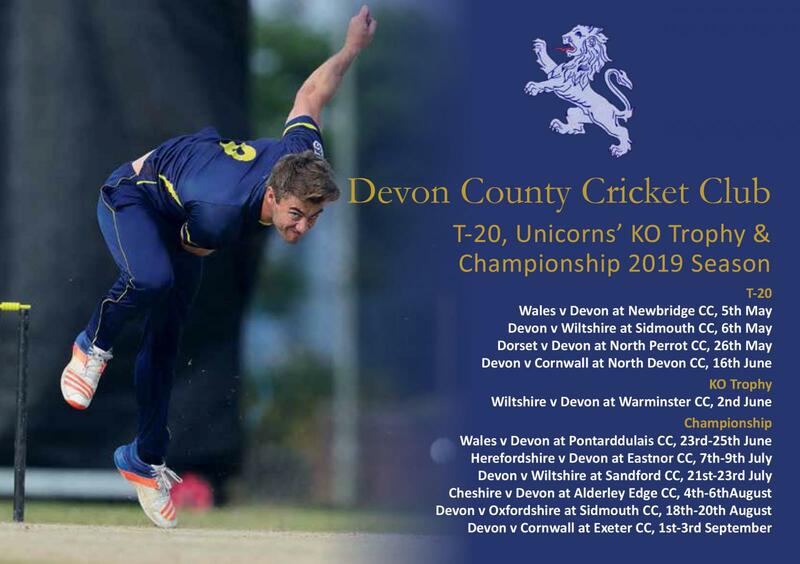 The fourth edition of the Devon CCC souvenir brochure has just dropped through the letterboxes of the county club’s 200-plus members. Since the brochure was launched in 2016 it has doubled in size from 32 to 64 pages – all of them in colour. The brochure is supported by advertising and sponsorship, raising money to help fund the county club’s fixture programme. In a typical season Devon play more than 30 days’ cricket, sometimes more if they reach the latter stages of the one-day cup competitions. Neil Gamble, the Devon chairman, said this year’s brochure is bigger and better than its predecessors in more ways than one. “The brochure has grown in size, sponsorship and advertising has doubled in four years and there is plenty of content for cricket lovers to enjoy,” said Gamble. “More of last year’s players’ data has been included in this edition and a special tribute has been paid to Josh Bess, the recently retired captain. Matt Thompson, who has succeeded Josh, writes about his hopes for the future and the challenge in the Championship of promotion and relegation in the Western Division in 2020. Other articles include a fascinating item by current Devon CCC secretary Nigel Mountford, who talks about following in his father’s footsteps into the county team. Members receive one of the brochures free of charge. To join the county club, contact Rachel Tozer via email at and get on the mailing list. Devon’s brochure project started around the same time as an initiative to raise awareness of the club in the public consciousness. County committee members and their friends have been out and about at county matches running raffle stalls to raise money for community charitable causes. More than £1,200 was raised in 2018, money which was shared between the Sid Valley Memory Café, Sidmouth Hospicecare and the David Shepherd Cricket Trust. Part of the charitable fund-raising effort are brochure launch-night team quizzes at Sidmouth and Bovey Tracey cricket clubs. The Devon Air Ambulance Trust and the Children’s Hospice South West are beneficiaries. 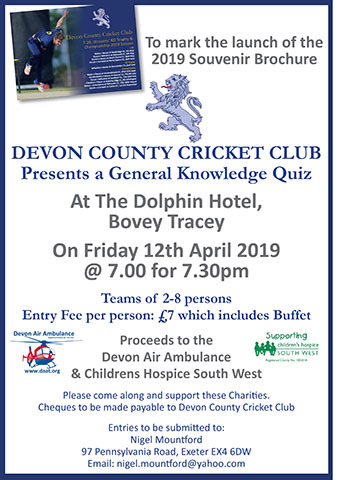 Bovey’s quiz night at the Dolphin Hotel in the town on Friday, April 12 kicks-off this season’s fund-raising. To enter a team contact Mountford via email or ring 07913 607352. Entry is £7 per player and includes a buffet supper. To enter a team in the Sidmouth CC quiz night on Tuesday, May 7 contact the clubhouse on 01395 513229 during opening hours.